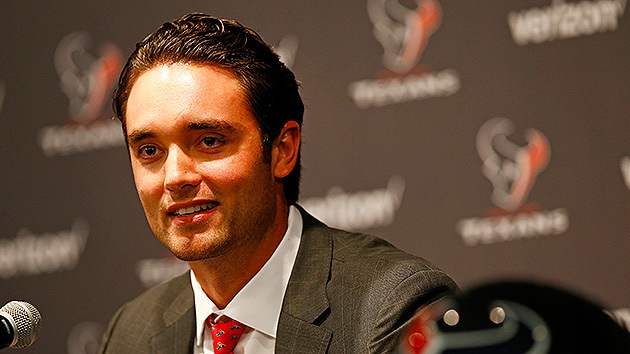 After surprising the league by electing to sign with the Texans instead of the Broncos, Brock Osweiler is ready for his close up in Houston. This story originally appeared in the March 21, 2016, issue of Sports Illustrated. Subscribe to the magazine here. Leaning against the wall behind Rick Smith’s desk is a driver—a golf club, not a chauffeur—on the underside of which is engraved the Texans’ logo. It is customary for Smith, now in his 11th year as the team’s general manager, to pace his office, taking practice swings while haggling with agents on speakerphone. “What was going on in here yesterday,” Smith said of March 9, during the early hours of the NFL’s free-agency window, “was a lot of conversation, a lot of swinging, a lot of fun.” In other words, Smith gripped it and ripped it, signing four players on that Wednesday alone, including one high-profile pickup—the NFL’s tallest QB, Brock Osweiler—who will merely determine whether the GM keeps his job. (His fellow signees: running back Lamar Miller, guard Jeff Allen and center Tony Bergstrom.) At 6' 8", Osweiler towered, in every sense, over an otherwise meh amalgam of UFA passers. By obtaining his signature, Smith not only filled his most glaring need but also foiled the best-laid plans of the defending Super Bowl champion Broncos. Drafted in Round 2 by Denver in 2012, the gunslinging Montanan had long been regarded as Peyton Manning’s heir apparent. Yet there was Osweiler last Thursday, getting a Cook’s tour of NRG Stadium in Houston. During a meeting with team owner Bob McNair, Osweiler received a Texans-themed necktie from the 79-year-old billionaire. The QB swiftly yanked off the red-and-white striped number he’d been wearing and put on the new one. When you’ve started seven games in your NFL career and a man gives you $72 million over four years ($37 million guaranteed), you flatter his taste in haberdashery. Big bucks got Osweiler onto a Houston-bound flight on the night of March 9. But did he bring a grudge along with him? After starting seven games in relief of Manning—and winning five of them, including victories over the Patriots and the Bengals, the AFC’s No. 2 and 3 seeds—Osweiler lost his job to the 39-year-old future Hall of Famer for the duration of Denver’s postseason. But did Osweiler actually believe those platitudes? Noel Mazzone says yes. Mazzone was Osweiler’s offensive coordinator at Arizona State. Before the QB’s sophomore year, in 2010, Osweiler was beaten out by Steven Threet, a transfer from Michigan. Frustrated, Osweiler told Mazzone that he was considering transferring to a school back in Montana. Hang in there until the end of the season, the coach urged. Weeks later Threet suffered a concussion in the first quarter against UCLA. With the Sun Devils trailing 17–0, Osweiler loped onto the field and threw four touchdown passes in a 55–34 win. He started the next 14 games and entered the NFL draft following his junior season. Now the OC at Texas A&M, Mazzone talks to Osweiler “maybe once a week.” So: Was his former pupil bitter about coach Gary Kubiak’s decision to go with Manning during the Super Bowl run? To be clear, the Broncos didn’t lowball Osweiler. Indeed, their final offer, a reported $65 million for four years ($29 million guaranteed), seemed generous for a 25-year-old with 305 career passing attempts. But, like airport food or anything purchased in Hawaii, the price of NFL quarterbacks is not tethered to rational economic forces. While he declined to engage the Texans in a bidding war, GM John Elway clearly hoped that loyalty—not to mention the lure of leading a Super Bowl champion—might tip the balance in Denver’s favor. It didn’t. 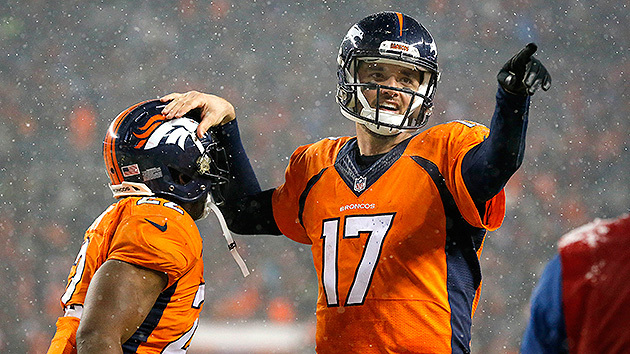 The future of Denver’s quarterback-of-the-future first became murky on Jan. 3. In Osweiler’s seventh start, a Week 17 game against the Chargers, he was intercepted twice in the opening half. The first of those picks hit the intended receiver in the hands. On the second, Osweiler’s right arm was jostled as he threw, the result of a breakdown in protection. Despite holding a 7–6 lead, he was yanked early in the second half, following a fumble by running back C.J. Anderson. Throwing infrequently but managing the game deftly, Manning led Denver to what would be a comeback victory, then—this had been Kubiak’s plan all along—took every snap in the postseason. Manning’s passer rating in a 24–10 win over the Panthers, 56.6, was the fourth-lowest ever for a winning quarterback in the Super Bowl. Afterward, during Manning’s month of Hamlet-like hand-wringing, Denver did not negotiate with Osweiler. Peyton announced his retirement on March 7; two days later Osweiler was a Texan. No, Osweiler insisted at his introductory press conference, he was not bitter about that benching. Sitting at a round table in the Texans’ offices 20 minutes later, he stuck to the high road while a reporter labored to discover whether he harbored any uncharitable feelings toward his former team. Hanging on the wall behind the desk of Texans coach Bill O’Brien is a framed photograph of an iconic New England sports moment: Bruins defenseman Bobby Orr frozen mid-flight, having just scored the Stanley Cup–winning goal against the Blues in 1970. “Well, I think he respects me,” wisecracks O’Brien, “but the next part is a lie.” In fact, O’Brien is a gentleman—honorable and ethical. He just doesn’t always sound like one. While the Patriots’ offensive coordinator, in 2011, he was nicknamed Teapot for his propensity to boil over in meeting rooms and on the sideline. O’Brien, who contends that his reputation for profane eruptions is exaggerated, has mellowed since taking the Texans’ job in ’14. Still, he wears his passion—for the game in general and quarterback play in particular—on his sleeve. Osweiler wouldn’t have it any other way. They have work to do. One of the reasons he was drawn to Houston, Osweiler explains, is that O’Brien’s system “fits my skill set very well.” That system calls on its quarterback to “basically be a coach on the field,” says O’Brien. While that’s the case with all NFL offenses, it’s safe to say that O’Brien and his highly regarded offensive coordinator, George Godsey, put a heavier-than-average intellectual burden on their quarterbacks. It has also been evident on the basketball court, going back to when Osweiler was a 6'4" seventh-grader scoring 50 points in a middle-school game. By the time he was a freshman at Flathead High in Kalispell, Mont., college coaches were coming to see him. “I watched him go up against some high-level competition,” recalls current Boise State coach Leon Rice (who was then a Gonzaga assistant), “and he would always outwork [opponents], outscrap them, out-tough them.” Rice reported back to Zags coach Mark Few: “This is the kind of guy we hang our hat on, a cornerstone guy we can win a lot of games with.” When Few offered Osweiler a scholarship midway through his freshman year, the teenager accepted. Over the next two years, as Osweiler went on to lead the state in almost every high school passing category, college football coaches started telling him he had a better chance of playing in the NFL than in the NBA. Then, after his junior season on the gridiron, Osweiler gave Rice a compilation of his football highlights. The coach watched with a sinking feeling. “Too big,” he replies with a smile. The Texans’ handicap, of course—the primary impediment between this team and a deep postseason run—has been their QB play. Matt Schaub was a slow-motion freight train derailment in 2013, when he threw pick-sixes in an NFL-record four straight games en route to a 2–14 record. Then, on Jan. 9 of this year, a nation looked on in horror as Brian Hoyer self-immolated in the wild-card round. His four-pack of picks, plus a lost fumble, doomed the Texans to a 30–0 loss to the Chiefs. It also ensured that this club, entering its 15th year in Houston, would spend another off-season in its thus-far-fruitless quest to find a franchise QB. J.J. Watt may be the NFL’s best player, as O’Brien believes, but he can’t go both ways all the time. Sure the Texans spent a fortune on Osweiler. The alternative, Smith says, was to trade up in the draft “to potentially get the guy we want.” But, with Houston holding the 22nd pick, that would get expensive. It’s a day of optimism in the Texans’ offices, but the fact remains: If the pride of Kalispell flops, he’ll most likely take O’Brien and Smith down with him. On this day, outside this stadium, it calls to mind a giant game of roulette.